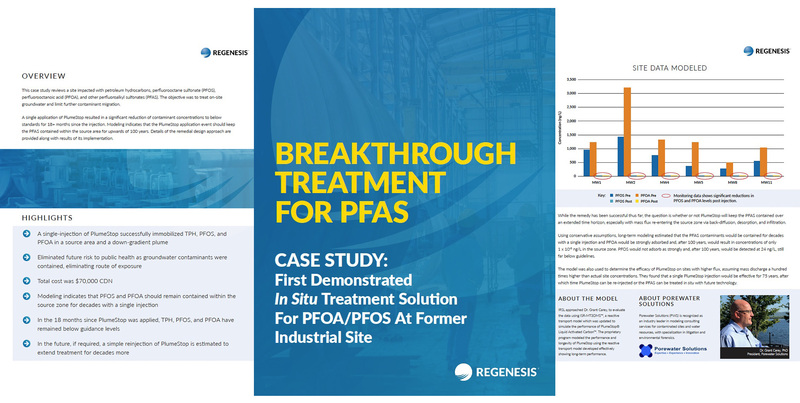 This case study reviews a site impacted with petroleum hydrocarbons, perfluorooctane sulfonate (PFOS), perfluorooctanoic acid (PFOA), and other perfluoroalkyl sulfonates (PFAS). 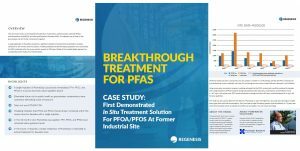 A single application of PlumeStop resulted in a significant reduction of contaminant concentrations to below standards for 18+ months since the injection. Modelling indicates that the PlumeStop application event should keep the PFAS contained within the source area for upwards of 100 years. Details of the remedial design approach are provided along with results of its implementation. One of Canada’s most experienced remediation companies, INSITU Remediation Services Ltd (IRSL) has designed, implemented, and maintained soil and groundwater remediation programs in diverse geological environments in North, Central, and South America, Europe and the Middle East. A respected environmental professional with over a quarter century in environmental assessment and remediation, Rick McGregor has designed and implemented remediation programs across the globe. An invited speaker at numerous international conferences and workshops, his knowledge leads the industry, based on his extensive experience, his innovative strategies, and his clear, pragmatic approach.